← Losing My Head Upon Request? Answer: Your neighbor is within his rights to haze geese from his property. Canada geese are state and federally protected under laws and regulations within the Migratory Bird Treaty Act and California Fish and Game Code. However, within those regulations, non-lethal hazing methods, such as harassment as done by this individual, are allowed to deter Canada geese from privately-owned property where property damage or a nuisance may occur to the landowner. Resident Canada goose populations have increased considerably since the 1990s in California. 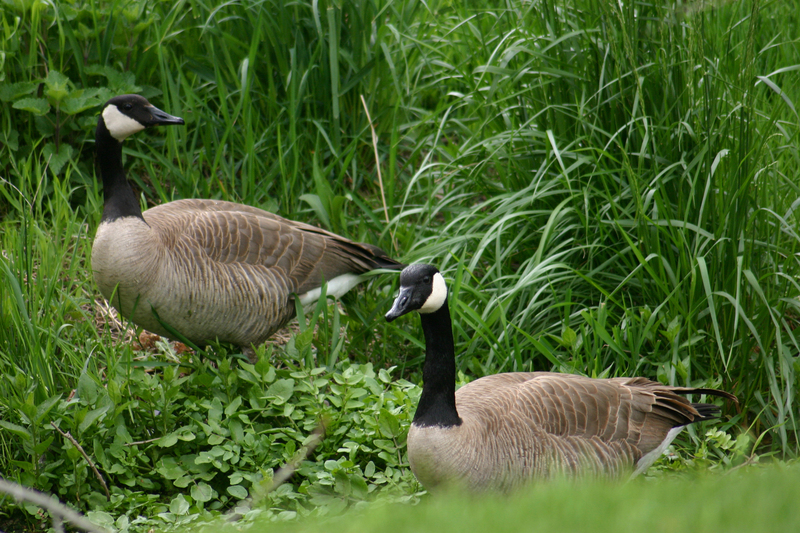 In this time, Canada geese have expanded outside their historical nesting range. Due to this increase, conflicts between landowners and resident Canada geese have expanded in many counties in California. Your neighbor is allowed to scare resident geese away from his property with non-lethal means at any time. The Department of Fish and Game (DFG) advocates that landowners take proactive non-lethal measures to reduce Canada goose use on impacted private property. Possible suggestions for hazing geese away from properties during the breeding season include landscape modification to make the area less attractive to resident geese (e.g. keep grass short to discourage feeding), use of dogs, visual deterrents, such as scarecrows, predator decoys, mylar flagging and balloons, and fencing. Additionally, waterfowl hunting can be an effective deterrent in problem areas outside the breeding season when state and local regulations allow this activity. For additional questions regarding how private landowners can best control problem Canada geese, please contact DFG’s Waterfowl Program staff at (916) 445-3763. Question: Do I need a fishing license when fishing a private lake on a ranch behind a locked gate? There is no public access. The lake is fed by a year round creek that originates on federal land. The fish in it were planted by a private party, but the fish do run up the creek to spawn. Thanks for the clarification. (Ken, Alturas). Answer: Yes, you need a fishing license. Even though this lake is on private property, a fishing license is required because the lake is fed by a permanent stream. A license would not be required if this lake is being maintained and operated as a licensed Aquaculture Facility. Highest number of abalone harvested in last decade? Answer: In 2007, a total of 309,000 abalone were harvested along the North Coast, which marked the highest abalone harvest season of the decade. That was the only year between 2002 and 2010 that more than 300,000 were harvested. According to DFG Environmental Biologist Jerry Kashiwada, these figures are calculated from a sampling of abalone report cards that were returned to us and a systematic telephone survey. The annual average for 2002 to 2010 was 264,000. Since this is based on what is entered on cards and wardens often encounter people who fail to complete their cards, we believe it represents the minimum number taken. Using lead projectiles in air rifles in Condor Country? Answer: DFG enforces the Fish and Game Code regulations after they go through the legislative process and are adopted by the Fish and Game Commission. You raise valid policy questions that may have been considered by the State Legislature and Commission in developing the lead bullet bans. DFG can’t speak for the Commission, but If you’d like to research this issue further, please contact the Fish and Game Commission directly. Their website is www.fgc.ca.gov. This entry was posted in Abalone, Firearms/Ammunition, Freshwater Fishing, Nuisance Animals & Pests, Private Land, Uncategorized, Waterfowl and tagged abalone, ammunition, freshwater fishing, nuisance wildlife, regulations, waterfowl. Bookmark the permalink. Excellent article. I am dealing with a few of these issues as well.